I thought I would treat you all to a pictorial essay. So, here goes. 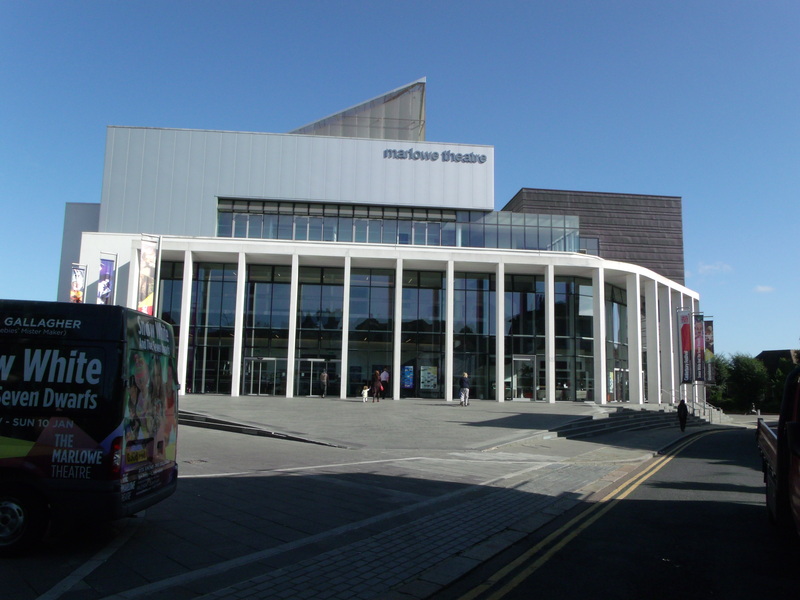 Just outside the door of the Pilgrim’s Hotel is the just refurbished Marlowe Theatre. A beautiful structure and it is quite busy and well-attended. The link is live to the theatre so you can check it out. 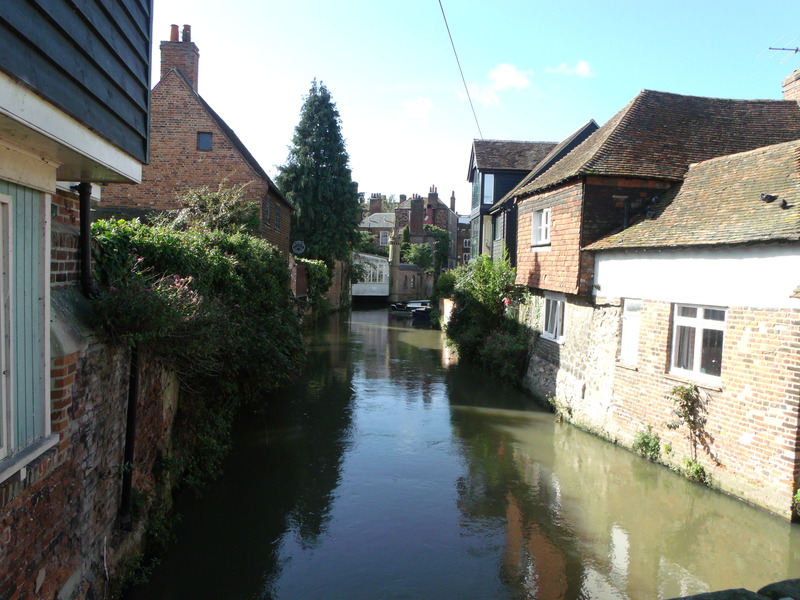 Just around the corner, the serene River Stour flows through the town. It appears so peaceful at the surface, but if you look over the bridge and peer into the water, the current runs persistent and strong. There are plants flowing in the water that puts me in mind of the Lady of Shallot slowly drifting down the river to her death from looking up from the mirror of shadows. Beware the current and look up from your weaving. A good lesson for us all. 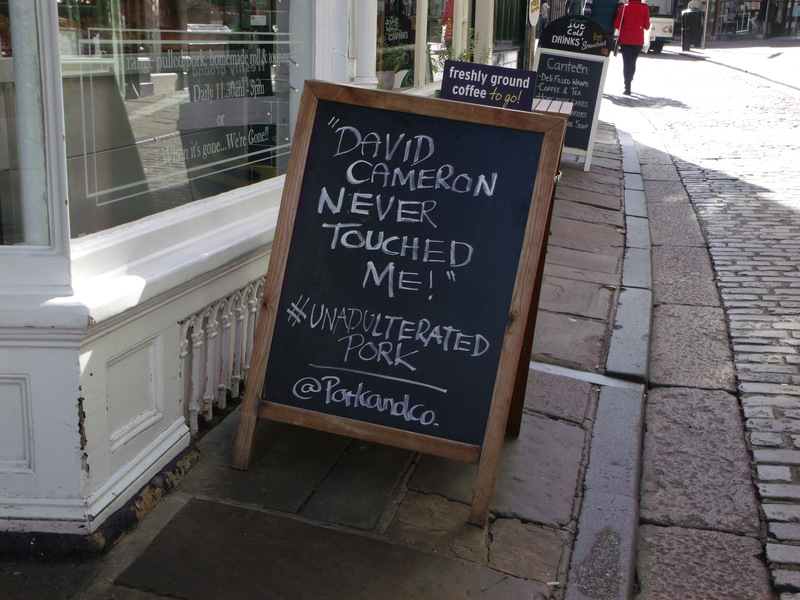 Ever the cheeky humourists, this is a sign featured outside a butcher’s shop just after the tell-all book about current PM, David Cameron came out this week. You’ll have to look it up if you aren’t up on the saucy politics of the UK. The square comes up fast. 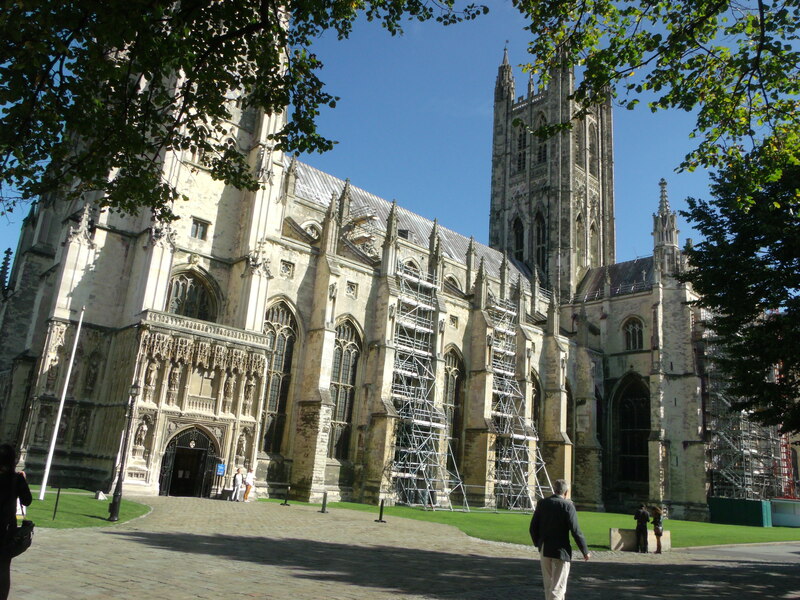 . .
. . .then down the road a bit more and you come to the entrance to the Canterbury Christ Church Cathedral. Admittedly, while it looks imposing from this shot, when you’re walking along the street, with lots of other stone and ancient buildings, it is not obvious that this is the entrance to the cathedral. As a matter of fact, the map of the city makes it appear that this is an open street. As you can see, it is anything but that. So, in we go. 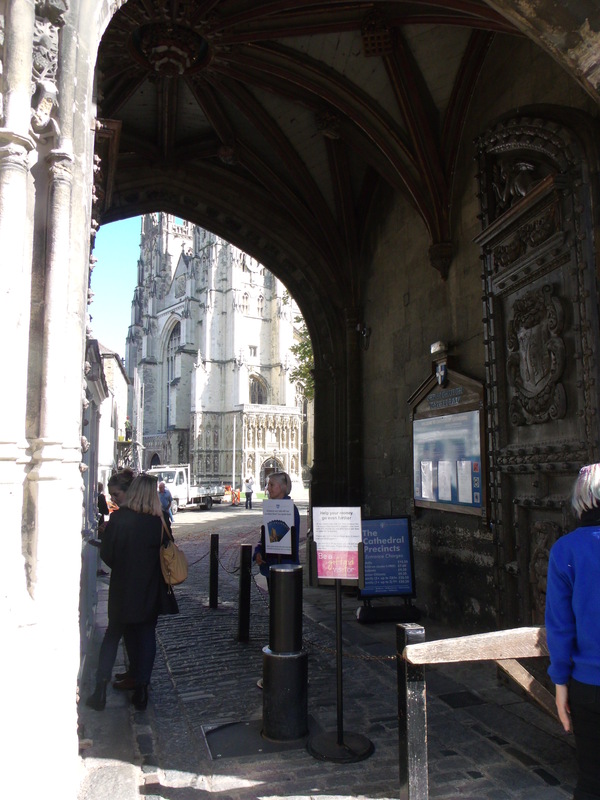 Walking into the entryway, you can easily now see the imposing cathedral through the arch to the back. For an American, the entrance itself is quite something to see in and of itself. BTW, if you’re ever here, it cost L10.50 to enter. I would hope that if one was coming to worship that there is no fee. 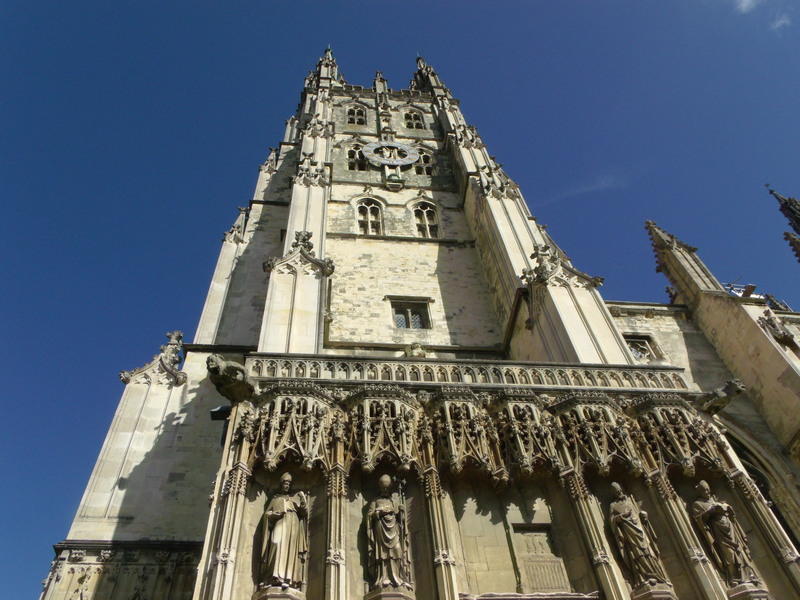 This structure is part of the Church of England. I found it impossible to get the entire building in one picture, so here’s a montage of photos to pin together in your mind. This building is under some sprucing up, as you can see with the scaffolding on this side. Even with that, it is a magnificent structure. And now to the interior. 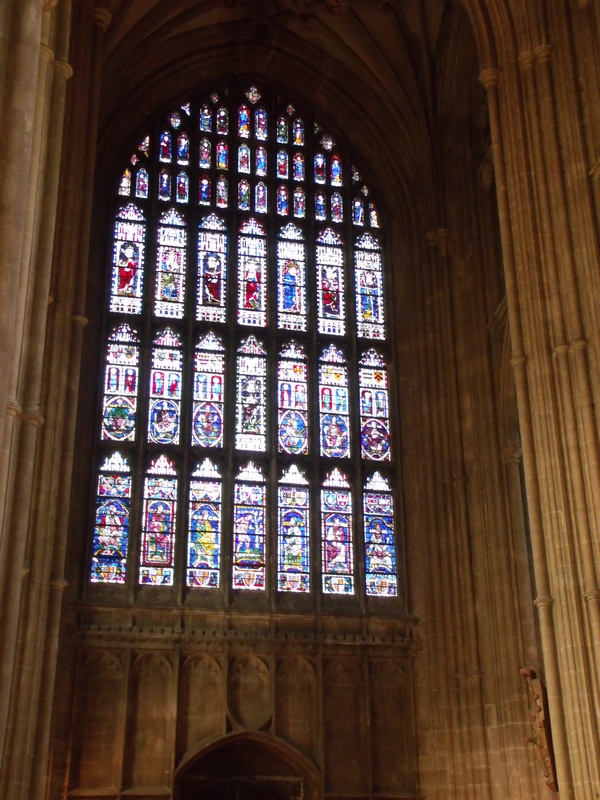 Grand Stained Glass. 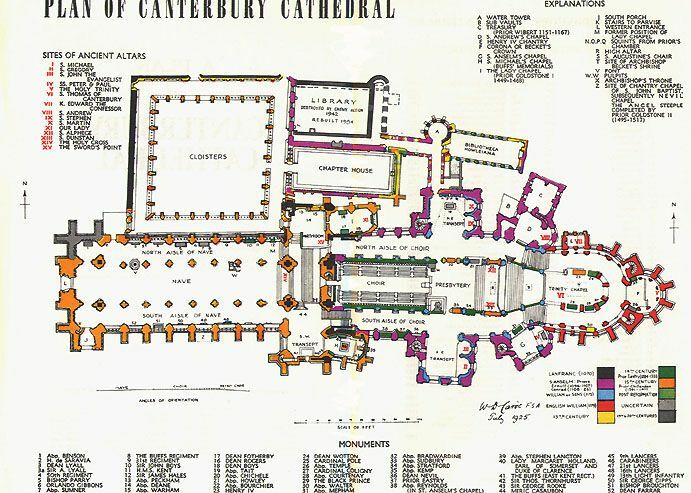 . .
I’ve included a floor plan of the cathedral above to you can get an idea of the vastness of this space. 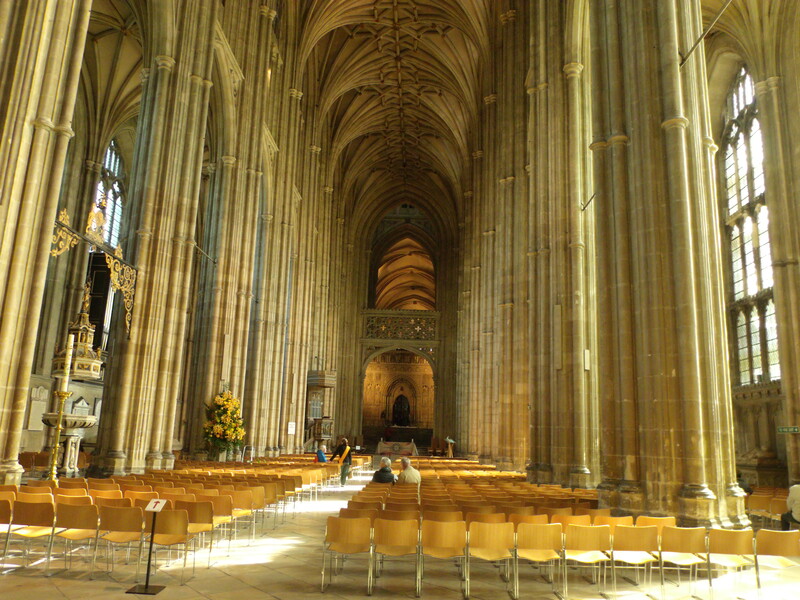 This picture is of the Nave. 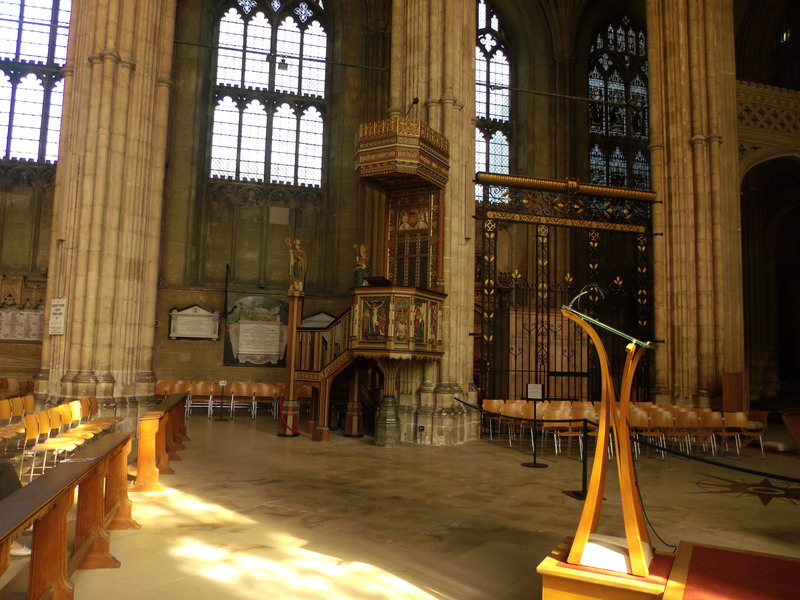 In the far back is the choir and beyond that the presbytery. 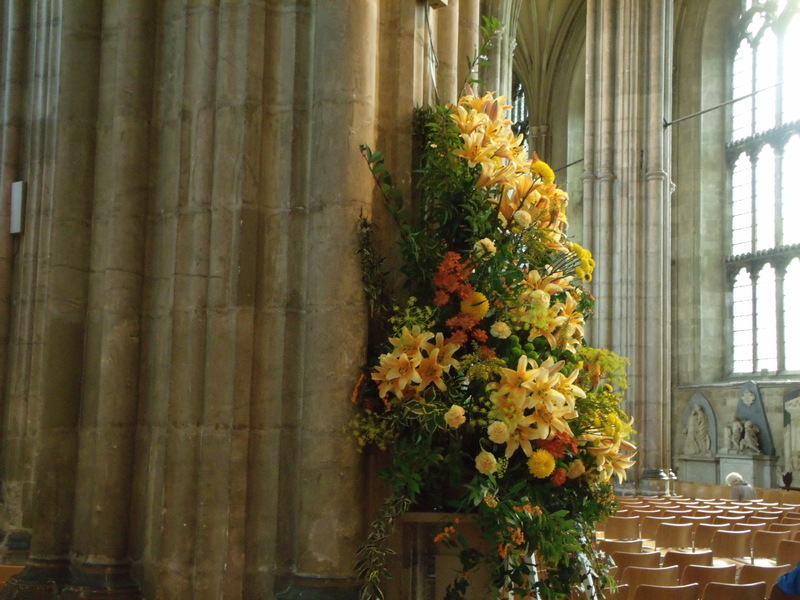 I walked along the north aisle where they were putting in these gorgeous fall flowers. I assume they are for a wedding later on. Just amazingly beautiful. The arrangement itself must be 5-6 feet tall and on a 4 foot pedestal. 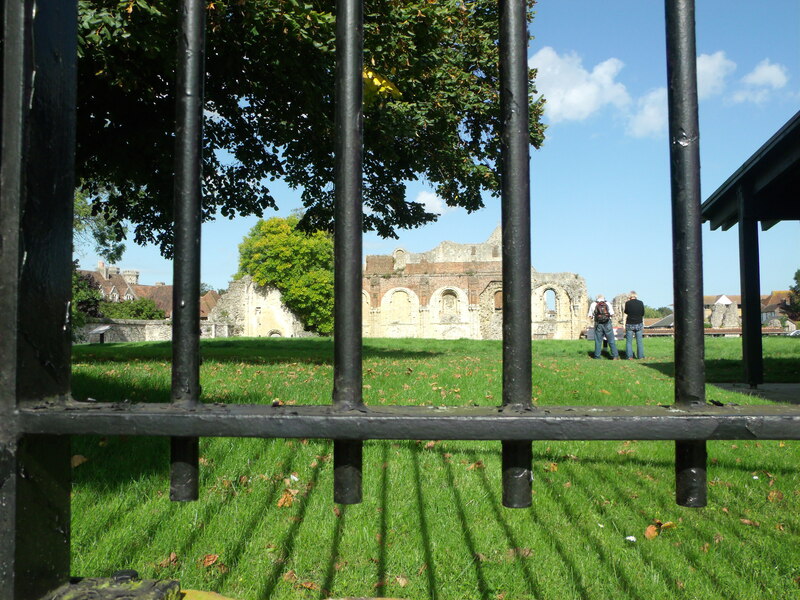 Moving toward the back and toward the Martyr’s area – that would be Thomas Becket. I didn’t take pictures there. It was just a bit too creepy for me and the area was really packed with tour-guide shepherds and their sheople eager to hear the gory tale of murder and mayhem. If you look here, just beside the woman in blue are gates. That is the mighty treacherous stairs going down to the Martyr’s level. 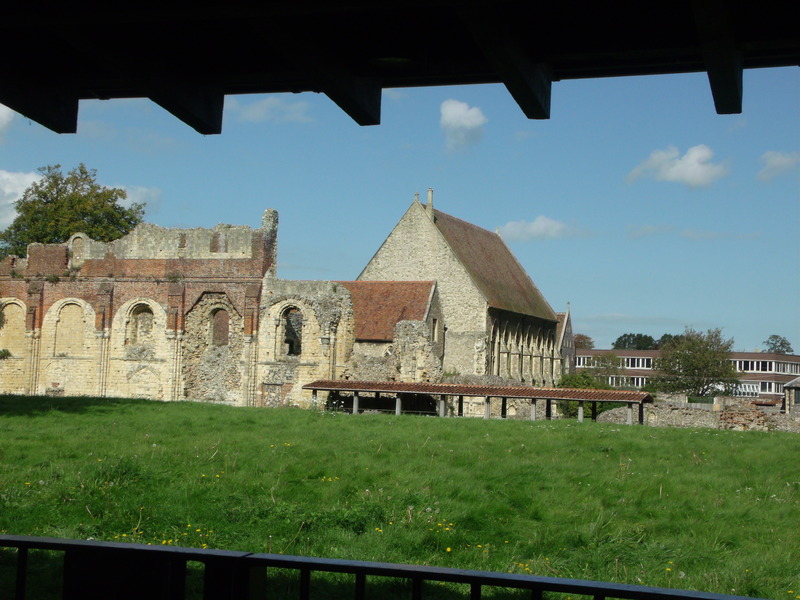 Of course much has been changed since Becket’s day, and it’s some speculation as to the actual spot, but, it’s the thought that counts. There are also images and icons of Becket throughout the cathedral on every level. From here, I went down to the crypt level to see an icon of what would appear to me the angel Uriel and an image of a Black Madonna and child. Unfortunately, you can’t take pictures in the crypts, so I kept my camera off. However, SHE lead me to the Icon and after another group of tourists had cleared the space, one of the curators came in to retrieve something. We, of course, started chatting, and she offered me the e-mail address for the archives so that I can purchase a picture of the Icon. Forthcoming! 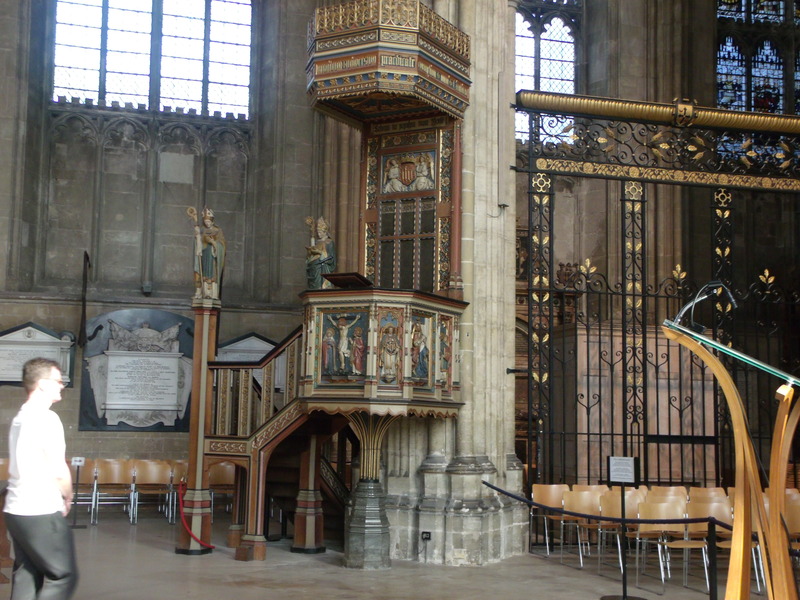 As I made my way out of the crypt, I took just a couple of other pictures to show the truly magnificent pulpit. I’d like to give a lecture on the Divine Feminine from that spot! Then, back out to the bright sunshine. 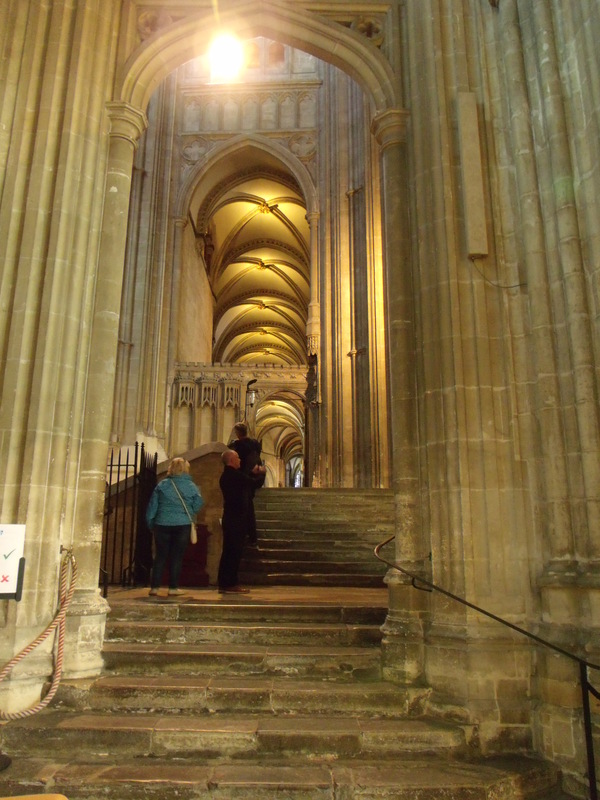 The exit from the cathedral is just as mysterious for the first timer as the entrance. This wall of buildings faces the same street as the entryway. 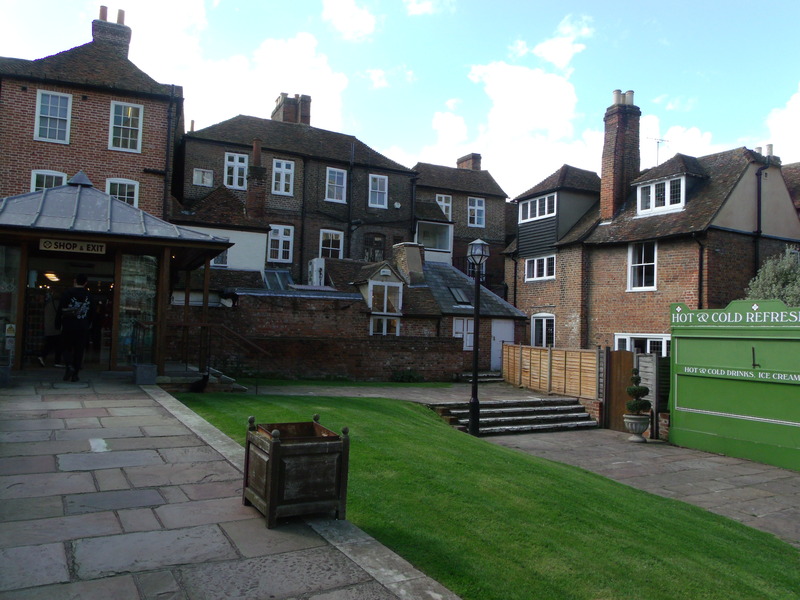 [These are the backs that open onto the grounds of the cathedral. Through the doors to the left is a huge gift-shop and way out to the street. 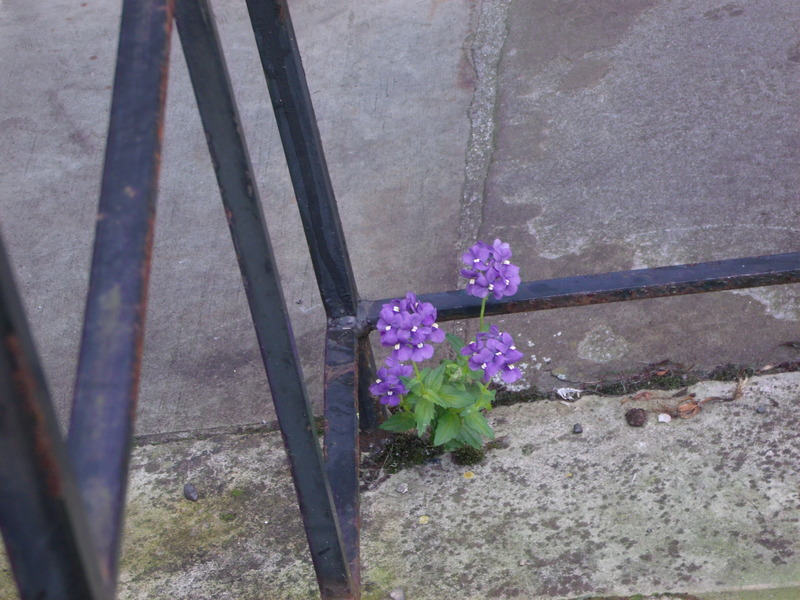 It’s all quite well kept and polished so when I saw this, I couldn’t resist the color purple. 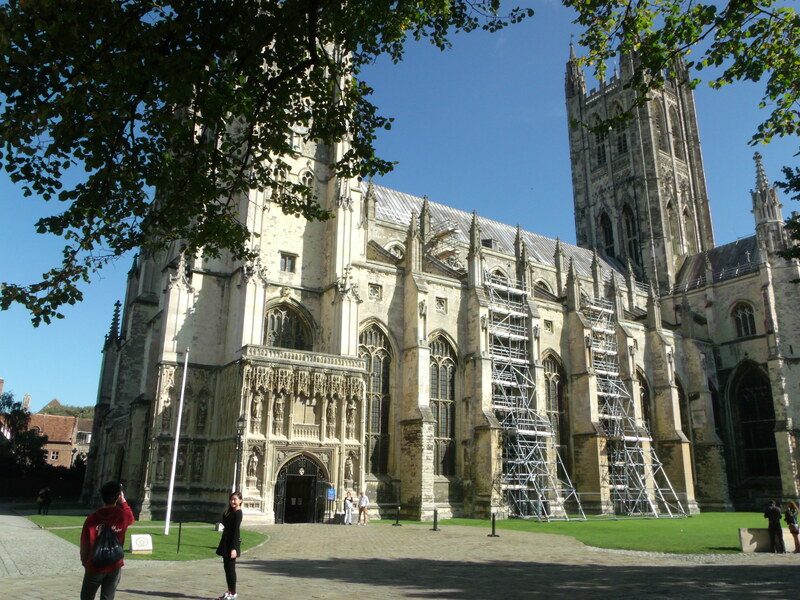 Remember that my ultimate goal this day is to get to the opening of the conference at Canterbury Christ Church University (CCCU)! [A short walk – for the healthy-legged!] But, for myself, it was quite a haul. On we go. This is a very old Methodist Church. If you know me, you’ll know that I grew up in a progressive Methodist family. 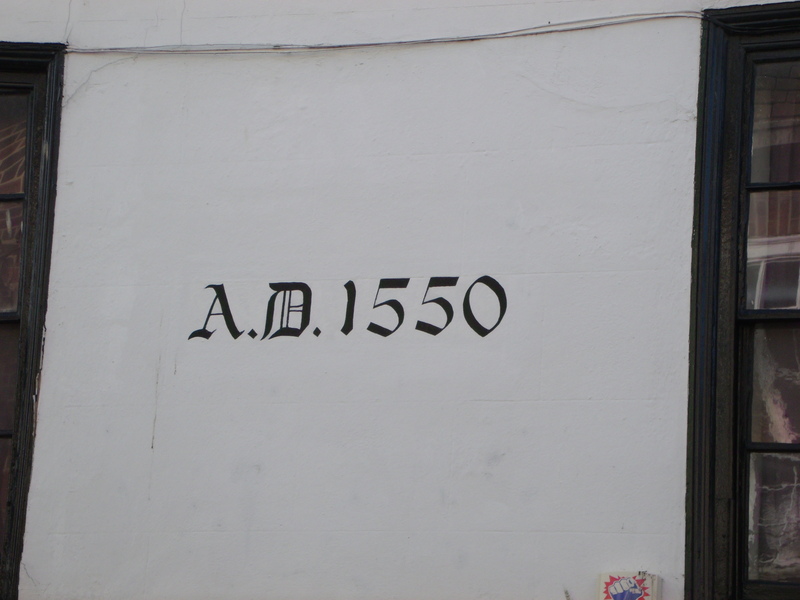 So, this is an homage to that gentle upbringing and to show the age of the place. 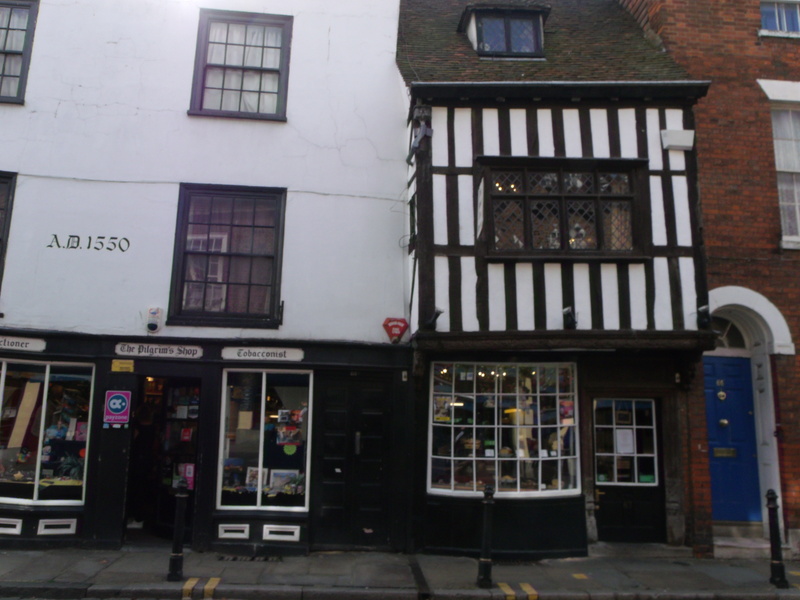 . .
And Tudor buildings still in active use. 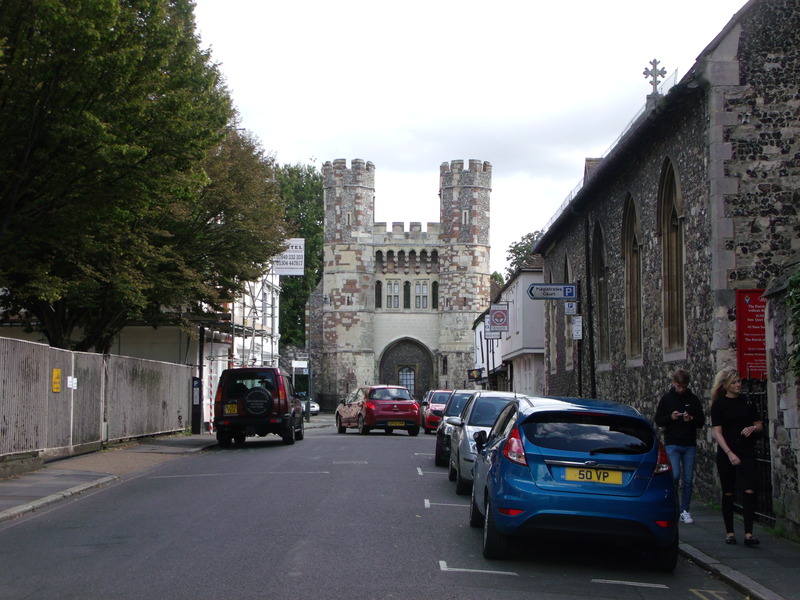 Well now you’ve seen Canterbury old town down from The Friars to Burgate Street. 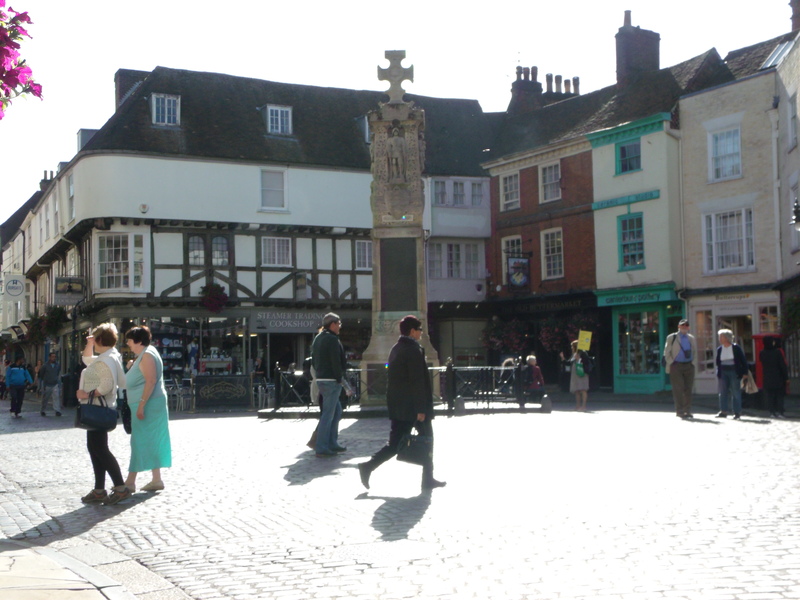 Now I headed onward toward CCCU. But before I arrived there, more architectural delights awaited. 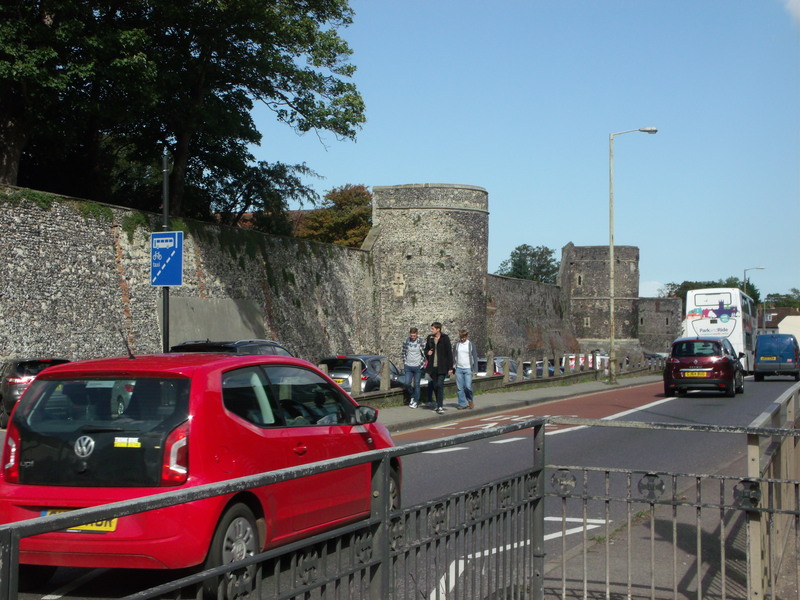 I’m crossing the main Ring Road [that’s a bypass for American drivers] and you can easily see the Roman Walls of the old town. 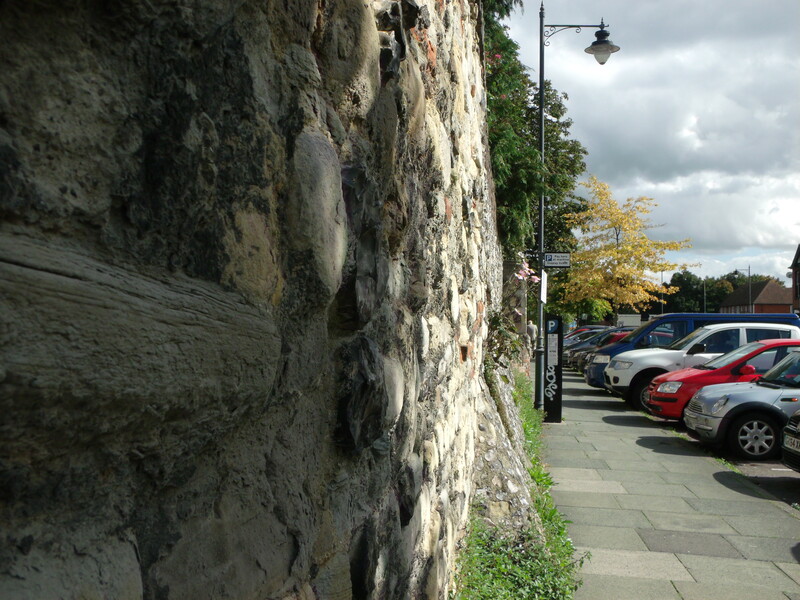 This wall goes all the way around and there are definite routes in and out if you’re in a car. On foot is much easier, as is most of England, and worth the aches to do it. Here is the opposite direction from the picture above. 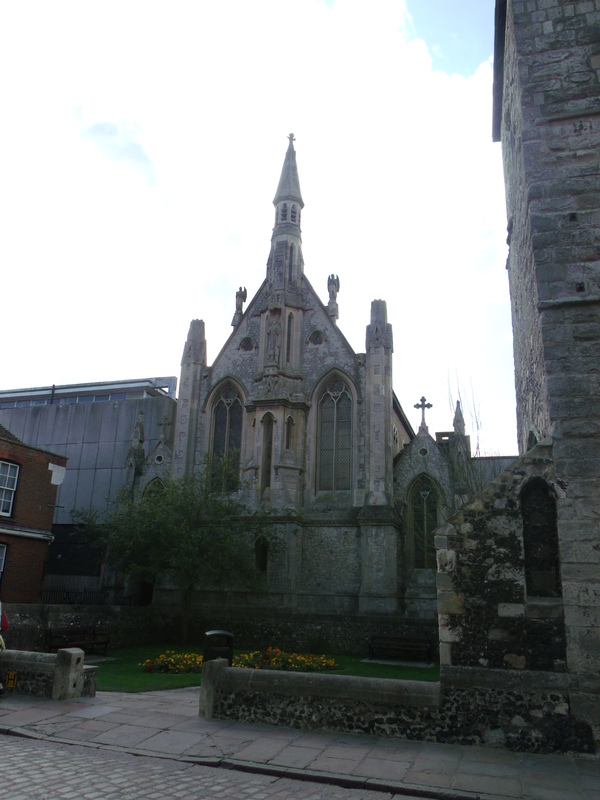 Everywhere you turn there is another ancient building, usually church-related. This one is now a school. I’ll be turning right at the end of this street and an immediate left to get onto Longport Street. 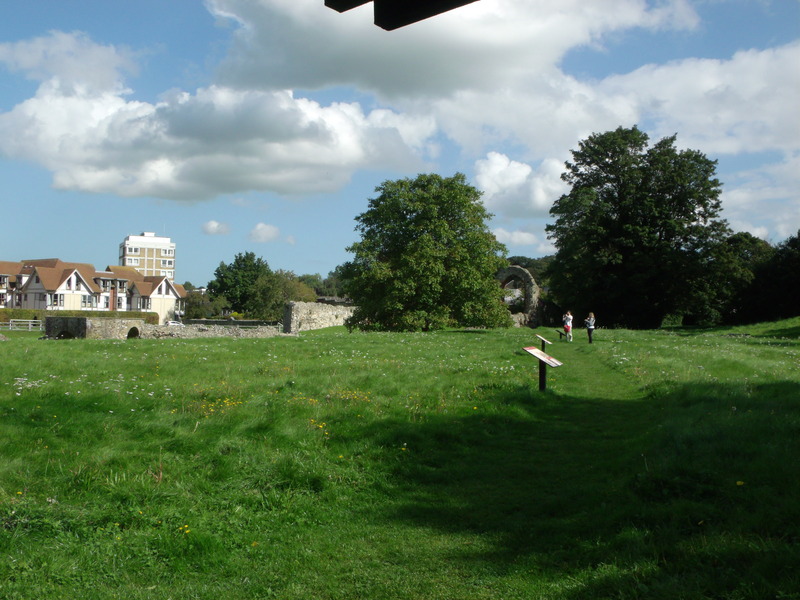 The ancient wall that runs down Longport and on past the ruins of St. Augustine’s Abbey. 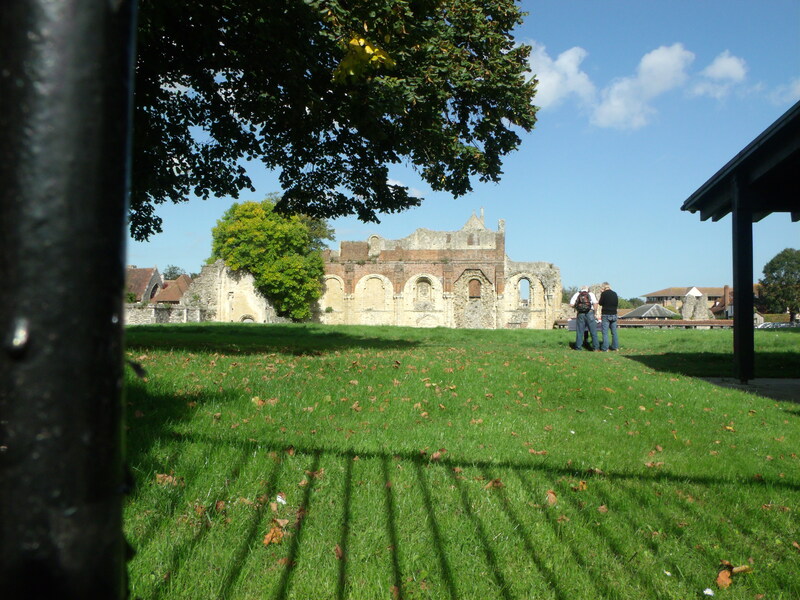 Here is the walker’s view of the ruins. The next stop, just a few hundred feet, is CCCU. 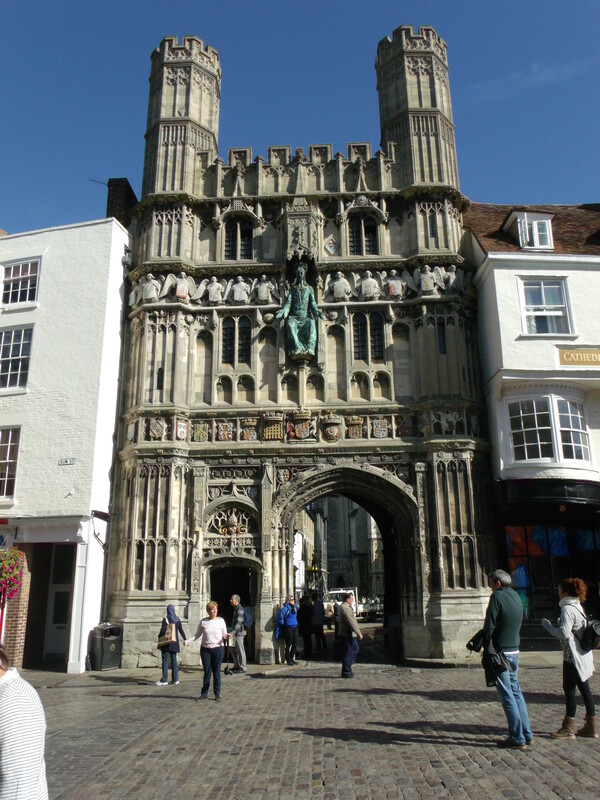 So ends the tour of Canterbury, a al, me. Next, the conference!